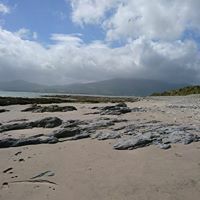 This day lived up to all those ideals as we to the beach and the destination was the Magharees with a group of 9 near Castlegregory just beyond Tralee. 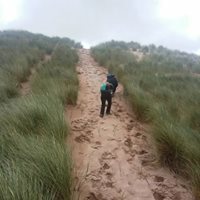 It was a day out with a difference as we probably only climbed one big sand dune and got a lot of sand in places that we did not know existed as it was all over us.But do not underestimate this day as it was a great day out. 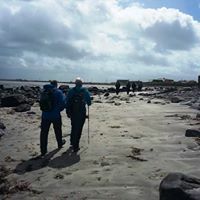 We started our walk in Spillanes Bar Car Park and headed on for the tip of the headland on the peninsula facing back in towards Tralee as well as Fenit Harbour on the other side. We skirted the headlands for a while before we reached our frst beach of the day & strolled along for a good while, which was on the eastern side of the Magharees before we hit land again crossing the road and onto our first Sand Dunes of the day to lots of giggles from some as it probably reminded them of days gone by from their youth. 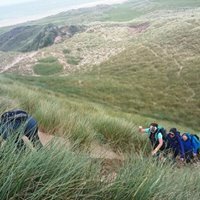 As we continued our journey through the dunes we eventually got to the western side of this out land and back to the beach we went again with a slight stopover for a snack in the dunes. Our youthfull past was definitely being explored today before finding ourselves back at the car park at Spillanes Pub again after another hike in the breeze with sand in our faces. The only problem was Spillanes was shut. But due to having local knowledge in our midst we found another port for a coffee. As is tradition now in our group we have a pit stop to reminisce the day we had and here we found everything from green soup to lovely big slices of brownies to girls with tattoo's on her legs to amuse us & our journey home & to end off another great day out with our group after our day at the beach. Just another day out to prove what a great country we live in.